Manasia Estate is situated at 50 km distance N-E from Bucharest, near Urziceni city, in the village of Manasia. The Manasia Domain is a sophisticated aristocratic yet contemporary landmark, where you can enjoy a short escape from the city’s tumult. 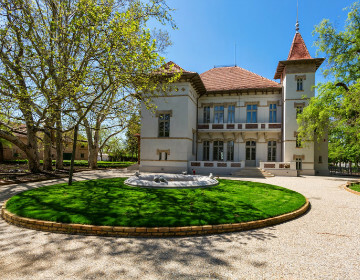 The domain includes a mansion (Hagianoff Mansion - an architecture jewel with historical resonance), a wine cellar, a gourmet restaurant and a park and it is the perfect destination for a chill getaway from Bucharest. Locals in Bucharest have reviewd Manasia Estate - International in Bucharest. You can find here description, reviews, address, map, phone, website of Manasia Estate in Bucharest. Visit Bucharest Tips for more International in Bucharest!